On the left side of this photo are California mussels. On the right side are gooseneck barnacles. In between are common (ochre) sea stars. A study of the ochre sea star (sp. Pisaster ochraceus) lead to the ecological concept of keystone species - a species that is critical to maintaining a healthy ecosystem. 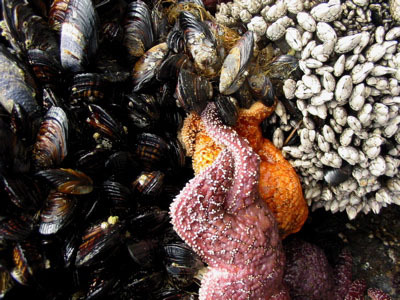 Without the presence of sea stars, mussels would likely overrun the ecosystem, altering its balance and significantly reducing its biodiversity.